Black Lagoon offers chemical-free lake and pond treatments to balance your aquatic ecosystems with all-natural biological augmentation. Our biological control routinely integrates the application of beneficial bacteria into many of our integrated pond management programs. 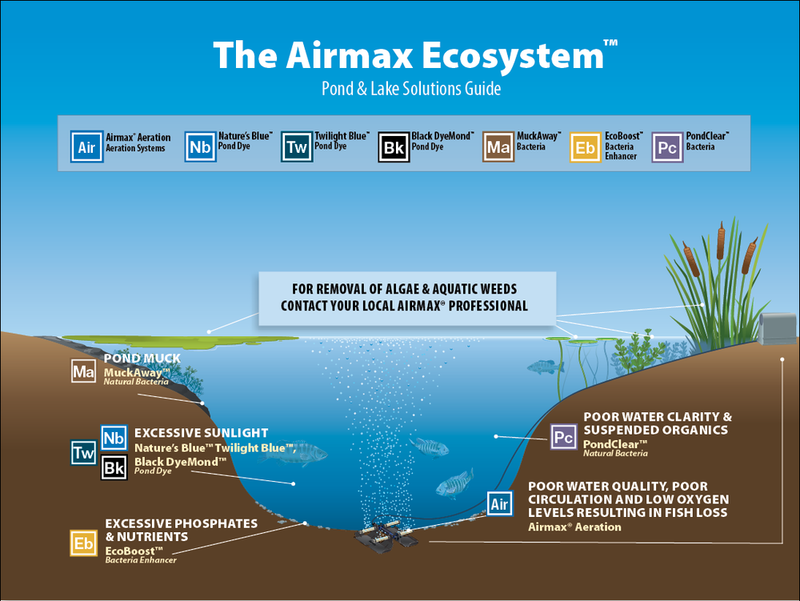 We have a series of privately labeled bacterial inoculants and pond dye products that can augment any algae control initiative. These products can either be applied by one of our trained staff biologists or by the do-it-yourselfer as there are no permits required to use these products. Black Lagoon's Biological Water Clarifier is an all-natural, beneficial bacteria designed to remove excess nutrients and eliminate noxious odors in your pond. Black Lagoon's Biological Water Clarifier naturally improves pond water by attacking suspended organic waste and muck. The bacteria digest organic debris, leaving you with water that is clean and clear, while promoting a healthy aquatic ecosystem. You will achieve the same great results using either our liquid gallon or water soluble packets. Black Lagoon's all-natural Biological Muck Reducer pellets digest accumulated organic debris, also known as "pond muck", that reside at the bottom of your pond or lake. Upon application, Black Lagoon's Biological Muck Reducer pellets sink below the surface of the water, releasing a specialized blend of beneficial bacteria which instantly begin digesting muck, improving water clarity and eliminating noxious odors. Black Lagoon's Biological Muck Reducer precision release pellets are easy to use and are great for spot treating troublesome areas such as beaches or shorelines. They can even be used in high-flow areas such as canals or lake front property. With regular use, Black Lagoon's Biological Muck Reducer can break down up to 5 inches of pond muck per year. It is strongly recommended that prior to starting any type of bio-augmentation program, that an aeration system be properly designed and installed. Adding bacterial products rapidly depresses dissolved oxygen in the water column. This lack of oxygen can stress aquatic life (i.e., fish) and dramatically reduce the effectiveness of the bacterial treatment.